(2015 A Thousand Words Contest) Moonwing the owl settles in with his new elf-friend Newt. 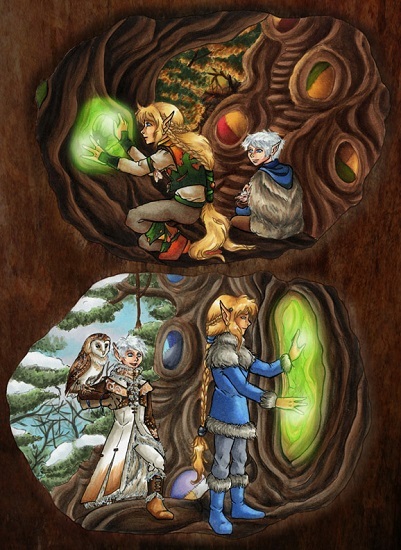 The hole forming in the den wall was just big enough for the owlet nestled in Newt's hands. Newt kept petting the tiny bird, doing his best to keep it calm as Cloudfern finished up its new home. "I think that will be enough for our little friend," Cloudfern said and let the magic glow fade from his hands and the tree. The hole he'd formed had ended up with some 'growing space' which made Newt smile. Of course Moonwing would need space to grow! He had a lot of that to do in the coming moons. Moonwing opened his beak at let out a shriek that would have frozen the marrow in the toughest of bones. It wasn't as piercing a cry as a grown owl would have managed, but it made both Newt and Cloudfern wince. Newt did his best to support Moonwing, who was trying to stand up in the palm of Newt's hand, without getting in the way of the owl's tiny wings. Being little more than three hands of days in age Moonwing hadn't quiet mastered standing up yet, so the attempt was a shaky one. He let out another shriek of dismay. Newt couldn't help but throw Cloudfern a worried look. "I knew there was something I'd forgotten about owls," Cloudfern said, but he was smiling and there was humor in his voice. "Sleeping will be� interesting with him around." Newt gave a laugh. "If we keep him fed we should be allowed to sleep sometimes." Moonwing had begun to nip at Newt's fingers. He wasn't breaking the skin, but used enough force to signal 'hungry' loud and clear. "Cubs of all kinds need a lot of food," Cloudfern said with a wink. "Don't count on getting too much sleep until your little friend is big enough to hunt for himself." "At least owls grow �" Newt interrupted himself with a yelp as Moonwing gave him an insistent nip and a third shriek. Cloudfern sighed. "I'll go see where Greenweave put the mice." "Moonwing, sit still!" Though his words could have been taken for angry, Newt sounded more resigned than anything else. "Please." Snowfall chuckled and gently pushed Newt's hands aside, taking over the work of grooming the owlet. "Careful is good, but too careful will make him nervous," she said. "Try again and remember to be like with the wolves � being direct shows him you trust him and that he can trust you." Newt flushed a little, but nodded. Moonwing wobbled and flapped his wings, which seemed to unbalance him more than help him stand up straighter. "Here, hold him like this." Snowfall reached out and gently took hold of Moonwing, moving him from the den floor to Newt's lap. "One arm should be enough to keep him still with. Use the other to pull the covering off his new feathers, like I showed you." Newt reached out, but stopped his hand a hair's breadth from Moonwing's feathers. The feathers were few and far between among the owl's down. They looked vulnerable and fragile. "I feel like I'm about to pull someone's hair out," Newt said to Snowfall, giving her a shaky smile. Snowfall returned his smile with more confidence in hers and raised an eyebrow. "Does he look like he's worrying much about it?" Newt looked down at Moonwing. The owl had settled down in his lap, eyes half-closed in anticipation. "Not exactly." If anything Moonwing looked ready for a long soak in a hot-spring. Carefully Newt pinched the thin tube that encased one of the new feathers and pulled. He half expected Moonwing to screech, to flap his wings and bite, but none of that happened. Instead the owl shifted in place, settling more comfortably in Newt's lap, all but cooing in pleasure. "See, he's enjoying himself," Snowfall said, reaching out to assist in the grooming. Hands steadier, Newt kept up with Snowfall, freeing feather after feather with gentle tugs. Calm flooded through Newt, a flowing summer river inside of him. He didn't even notice Snowfall sitting back, leaving the rest of the grooming to him alone. When Newt looked up again Greenweave had joined Snowfall in watching him, both smiling. "You have quite the hand with birds," Greenweave said and ruffled Newt's hair. "Good practice for when you have cubs of your own one day." "Yes, cuddling is as important for cubs as it is for owls," Snowfall said. There was a wistful, nostalgic note to her words. "Though cubs tend to squirm more when they're being groomed. But you'll find that out in time I'm sure." Newt rolled his eyes, his lips quirking into a smile. He opened his mouth, searching for words to form a reply, when a shriek cut him short. The sharpness of a beak began to nip at the fingers of his left hand. "Also good practice for future cubs," Greenweave chuckled, exchanging a knowing look with Snowfall. "I'll go find him some mice," Newt said, doing his best to balance Moonwing in his arms while getting to his feet, without ruffling the owl's feathers. "Thank you for the lesson, Snowfall!" "You are more than welcome. It's been far too long since I had the chance to groom a fledgling bird." Snowfall got up from the floor and gave Newt a pat on the shoulder before heading toward the den's exit. "I should go prepare for the hunt. Let me know if you need more help." Out of the corner of his eye Newt saw Snowfall leave and gave her an awkward wave. It was best to get Moonwing a mouse quick or his fingers would suffer for it. Somewhere behind him he heard Greenweave chuckle. "While you deal with that I'll go get us some food. I think you've earned it." Newt acknowledged this with a nod, careful not to jostle the tiny owl screeching at him. Despite the racket and his own lack of sleep Newt found himself giving the Moonwing a fond look. Like having cubs indeed. "And I thought wolf pups grew fast," Greenweave murmured as Newt offered Moonwing another mouse. The owl took it from Newt's hand and swallowed it with an ease that would have been impossible just two hands of days ago. Newt watched the display with a proud smile before offering Moonwing the next mouse. The owl's hunger seemed to be calming down because this mouse got torn apart piece by piece before being devoured. "Snowfall says he should start practicing hunting soon," Newt said. Greenweave gave a snort. "I'll warn Cloudfern." "Ouch!" Newt pulled his hand back and resisted the urge to stick his bleeding finger in his mouth. Greenweave looked up from the net he was mending, giving Newt a worried look. "What happened?" Moonwing had stopped ripping the mouse apart and was looking at Newt, almost as if he was sorry for what he'd done. He gave a chirp and bowed forward, seeking to push his head against any part of Newt he could reach. Offering his uninjured hand for Moonwing to buff his head against Newt showed his tiny wound to Greenweave. It was little more than a scratch along his index finger, though there was plenty of blood seeping out of it. "Just an accident," Newt said. "I should be more careful while he's eating." He gave Moonwing a reassuring scratch on the head so the owl could calm down and return to his meal. "His talons are getting bigger and stronger along with the rest of him." There was something thoughtful in Greenweave's voice. "That's hardly a surprise." Newt frowned, thoughtful, then shook his head to clear it. "As I said, I just have to be more careful." Greenweave gave a hum in way of reply, eyes and hands returning to focus on the tangled net in his lap. Newt studied him for a moment, trying to figure out what he was thinking about, before shrugging it off. As soon as Moonwing had finished eating he'd need to go find someone who could make some owl-friendly toys. The sound of trinkets and bowls crashing to the floor greeted Newt as he entered the den. "Moonwing making trouble?" he asked, pulling the door-hide shut behind him, brushing snow from his shoulders. "No more than usual," came Greenweave's reply. He was sitting curled up in his and Cloudfern's bedbowl, working on some leather braiding by the looks of it. "Cloudfern is taking the brunt of it." A squawk drew Greenweave and Newt's attention to the other side of the den. Cloudfern stood over by a low shelf, herbs spread out all over it in a big mess. He had one hand to his mouth, the knuckle of one finger between his lips. Moonwing was perched on a shelf higher up, eying Cloudfern and his hand with a fixed gaze, looking ready to attack. Again. Newt flinched. There were plenty of toys for Moonwing to play with. There had been more than one tribemate happy to provide them, and Newt had given making some a try as well. Despite that Moonwing seemed to return to one prey and one prey alone. Shrugging out of his winter clothes Newt hurried over to Cloudfern and Moonwing. The owl hesitated for a moment, but hopped off the shelf and onto Newt's waiting arm. Having put Moonwing back in his own small den, Newt turned to Cloudfern. "Are you all right?" "I'm fine," Cloudfern said, taking his hand from his mouth. "Though I'm almost jealous it's Greenweave going up to Cascade Hill tomorrow and not me." There was humor in his words. "I would be happier if your pet stopped pouncing on my fingers while I'm working." "That just means he likes you," Greenweave said, lips curled in a teasing smile. Cloudfern gave a chuckle that made Newt relax a fraction. "Right. Or that he wants to eat me." "I'll help you with that," Newt offered, gesturing at Cloudfern's bloodied knuckle. Tending to your own hands were by no means impossible, but it was an annoyance one usually preferred to avoid. The reassuring smile Cloudfern gave him melted the last of the tension out of Newt's posture. "It's just a scratch. And I've got only myself to blame for not keeping an eye on him, so don't worry. " Taking a step back, Newt gave a one-shoulder shrug. "I'm sorry but he really seems to like your fingers." "Can't blame him," Greenwave quipped, not missing a beat. He met the eye-roll that got him from Cloudfern with a wink. Newt couldn't help but laugh. Newt sat holding his breath as Moonwing approached the edge of the doorhole. The owl shifted his wings and chirped, switching his weight from talon to talon. Outside dusk was giving way to night. "Seems we're in for another night of indecision. He might need a helpful nudge from his 'da'," Cloudfern suggested. "I won't push him," Newt said, though he knew Cloudfern's suggestion hadn't been serious. "He'll-"
Flapping pulled Newt's attention back to the doorhole. Moonwing was gone. For a heartbeat Newt couldn't breathe. He felt caught between elation and terror, gaze fixed on the world outside the den. He almost closed his eyes, half expecting there to be a painful thud to follow the flapping of inexperienced wings. And then the moment was over and Moonwing was rising higher and higher on the wind. "He's flying!" The words tore out of Newt's mouth in pure excitement. He could feel his own heart hammering to the beat of Moonwing's ascent. "Do you see that? He's really flying!" Moonwing had reached a quite impressive height and was circling a few tribemates standing in the snow below him. Newt didn't have the presence of mind to register who said tribemates were, only that they were making encouraging noises. After circling around the Father Tree once, Moonwing made a wobbling turn, aiming himself at the Child Tree. "He's coming back this way," Newt said, pulling the hide that usually hung over the doorhole further aside. "He's looking a bit unsteady." Cloudfern frowned. "Should we-?" Yelping and laughing the two elves ended up on the floor of the den as Moonwing came rushing in through the doorhole. It took a good while to clean up the mess his crash landing caused. "He should start hunting for himself soon," Newt said to Cloudfern, smiling as Moonwing tore the rat in half and gobbled down the bloodied remains. "Look at him go!" "Let us hope so," Cloudfern said, his tone teasing. "I'd love to get some more sleep around here." Moonwing looked up from the bloodied mess and chirped, almost as if he wished to join the conversation. Or, more probably, he just wanted attention. Looking at him Newt had a hard time grasping how fast Moonwing had grown. He looked like an adult owl now, his feathers and size changed from the little owlet Newt had found not that long ago. Stroking the feathers on Moonwing's head with a finger Newt smiled to himself. "You'll be hunting before I know, I'm sure." Snow lay on the ground, an almost untouched layer of white that covered the entirety of Broad Meadow. "Are you two ready yet?" Newt chuckled at Crackle's impatience and stroked Moonwing's head with a finger. The owl shifted his grip on Newt's arm and closed his eyes in enjoyment. With all the patrols and watches planned it was rare to get together as a larger group. It felt good to be out enjoying the night without any of them having to hurry off soon. "You can't rush them," Dreamflight said, giving Crackle something that wasn't quite a glare. "If flying was easy we'd all be doing it." There was a wistful note to her words, but no one mentioned it. Crackle just shrugged. "Maybe Fadestar can get up there with him?" "I might be older than him, but Moonwing is better built for flight," Fadestar cut in, hugging herself and rubbing her hands over her upper arms to emphasize her lack of wings. "And long patrols take a lot of energy out of you." Her slightly drooping posture attested to that. She'd returned almost two nights ago together with Brightwood, and while not exhausted she did look like she could use another good day's sleep in a den. "Hush," Dreamflight said. "They're about to start." Newt's smile widened as all eyes turned to him and Moonwing. He gave Moonwing one last scratch before raising his arm in signal. They'd practiced this of course, but four-and-three nights wasn't much time to learn a new skill. But it was worth a shot. He could feel Moonwing's excitement in the way he shifted his grip on Newt's arm. "Go!" The order was gentle, as was the motion of Newt's arm. Moonwing took flight with an ease he'd lacked in his first attempts. "Oh that looks like fun!" Crackle exclaimed as Moonwing climbed higher and higher on the wind. "My turn next!" "It doesn't work like that," Dreamflight cut in before Newt could comment. "Would you ask to ride someone else's bond-friend just like that?" Crackle gave Dreamflight an annoyed look. "Moonwing's a pet, not a bond." "High Ones," Dreamflight muttered. "I swear this is more like cubsitting than owl-watching with you around." "He's gotten really good at flying," Fadestar said before Crackle and Dreamflight could take that mounting disagreement any further. "Wish I could learn that quickly." Newt gave a laugh, and nodded at Fadestar in a silent thank you. He held up his arm again. He hoped Moonwing would understand the signal - he'd been a bit spotty with the return signal, getting too caught up in the flight. With a final sweep of the meadow Moonwing gave a cry that could have been described as triumphant. Two flaps of his wings and Moonwing's talons were wrapped around Newt's arm. Perfect landing. "Well done, Newt!" Crackle crowed. Fadestar and Dreamflight joined in, if in less deafening tones. The excitement got to Newt, he had to admit later on. Watching Moonwing fly was one thing, but interacting with him like this, working together � Moonwing wasn't a bond-friend, but there was something between them still. Again and again he sent Moonwing back up into the air, to the cheers of his friends. His arm was growing tired and his cheeks ached from smiling; good weariness. "Here he comes!" Crackle called out as Moonwing made the turn at the end of the meadow. "You have to let me try next!" Newt shook his head at her. He could hear Dreamflight drawing in a breath, probably to launch into a counter argument. That was what made him take his eyes off Moonwing and half-turn to face Dreamflight. The pain that shot through his arm was far worse than the soreness of overworked muscles. Moonwing's shrieking had Newt whirling around, legs shaking, teeth gritted. There was blood. A lot of blood. "Newt!" Fadestar was at his side, steadying him. On his other side Dreamflight was doing her best to get the panicking Moonwing's talons out of Newt's arm. Newt gulped, averting his eyes. He needed to think fast. "I'm getting Willow!" Crackle was off on her bond before anyone could comment. Biting the inside of his cheek until it was as bloody as his arm, Newt tried to catch Dreamflight's gaze. Her eyes were on Moonwing, perched on her arm now. He was screeching still, shifting his weight from talon to talon, but there were no tears in Dreamflight's clothes, thank the High Ones. "Can you calm him down?" Newt asked. He felt faint, but he could keep on his feet. Dreamflight gave a curt nod. "Are you all right?" "It's�" Newt glanced down at his arm. The wounds were deep, but there were only two of them. "It's not too bad. I'll be fine." He was glad he could say that with some confidence. "Fadestar?" She stood with her hands raised, as if caught between steadying him and running for help. "I need you to keep pressure on my arm," Newt said to her. His vision remained free of blurs, for which he was grateful, but blood loss was nothing to leave alone, no matter the size of the wound. "Can you do that?" Fadestar blinked, then switched to Newt's other side and wrapped her fingers around his bleeding arm. He had to bite back a yelp. "Let's get you back to the Holt." Dreamflight had Moonwing on her arm still. The shrieking had stopped. "Fadestar, is your grip good enough?" "It's good enough," Newt answered in Fadestar's stead. "I'm not dying." He did his best to smile. He really wasn't dying, but he did feel like a fool for getting hurt in the first place. I should have been paying attention to Moonwing! "Do you need to lean on me?" Fadestar asked. There was a tremor in her voice, but her expression was determined. She looked ready to carry him. "I'll do that." He didn't need the support but that wasn't really the point. The slow walk back to the Holt was interrupted by Willow and Crackle rushing towards them on wolfback. Willow's healing touch was such a relief Newt let his knees buckle. With a healed arm and help from his friends, Newt felt his legs steady. Head clearer he turned to Dreamflight and said: "I can take Moonwing now." Dreamflight, who'd been stroking Moonwing's feathers, bit her lower lip, her hand freezing in mid-motion. "Are you sure?" Newt wanted to snap 'Of course I'm sure! ', but held his tongue. Instead he motioned for Moonwing to hop onto his uninjured arm. It stung that Moonwing hesitated. The rest of the walk back to the Holt was quiet. Newt said goodbye to his friends at the foot of Child Tree, after having reassured them yet once more that he was fine. Thankfully Moonwing had calmed down, which was a weight off Newt's shoulders. He climbed the stairs to the second level deep in thought, Moonwing carefully balanced on his arm. Greenweave was waiting for him inside the den. He didn't say anything until Newt had put Moonwing down inside his den-tunnel. "Dreamflight sent to me," Greenweave said in explanation. "How is your arm?" "It's fine," Newt said, shrugging out of his shredded white-cold clothing. "Willow healed me right up." "Looks like you could use some new clothes though," Greenweave said, eyeing Newt's torn sleeve. Newt shrugged. "It's just a few tears. Quick fix with a thread and needle." He attempted a smile, but it wouldn't quite stay in place. Pushing off the bedbowl he'd been sitting on, Greenweave moved to Newt's side and presented him with� something. "I should have given you this sooner." Newt frowned, studying what Greenweave was holding. It took his tired mind a heartbeat or two to connect the dots. "Oh!" With gentle fingers Newt took the leather wrist guard from Greenweave's hands. It was a thick glove with extra leather along the back, light but sturdy. Clear protection from sharp talons. "Cloudfern and I talked to Moss about making one. I braided the leather strings here myself." Greenweave trailed his fingers over the strings holding the thicker leather to the glove. "I'd meant to give it to you when I came back from my last watch on Cascade Hill, but Cloudfern was leaving the same night and�" Greenweave trailed off and chuckled, cheeks heating just the tiniest bit. "It's a good thing Willow was in the Holt." Newt had no trouble keeping his smile in place this time. All brooding thoughts about Moonwing and flight were fading and he felt light as air. Without a word he pulled Greenweave into a hug. "I� I don't think he's coming back." Newt felt Cloudfern's hand land on his shoulder. It was a comfort, but it also made his stomach churn. Putting hands on your shoulders - that was the body language of someone preparing you for very bad news. It had been a moon's turn since Moonwing first flight. Only a moon's turn. And only a day since he'd killed his first own prey. "We'll wait a little longer, if you want," Newt heard Greenweave say and he gave an answering nod without tearing his eyes from the treetops. Greenweave's hand joined Cloudfern's on his shoulder. Holding his breath Newt put off answering, willing white wings to come gliding through the falling snow. But the night remained still and cold. Toes numb and breath burning in his throat Newt closed his eyes and bit back a noise � maybe a curse or a whimper, he didn't know himself. He felt foolish all of a sudden, standing out here in his new winter clothes; clothes fashioned to match Moonwing, clothes to replace the ones Moonwing's talons had ruined. "We'd better go inside," Newt said to his fathers, casting his gaze down, away from the treetops. "E-even if he's coming back there's no telling when." "He knows the way home," Cloudfern said in agreement. "He might be having trouble finding prey in this weather. Or he might just want to stretch his wings. We'll just have to wait and see." Deep in thought Newt let himself be led to the Gathering Den. The night behind him remained free of beating wings. A cold gust of wind along with something bounced against Newt's face, pulling him out of sleep with a start. Blinking and rubbing at his eyes it took him a moment to register exactly what was lying on the fur next to his head. The smell of dead mouse had him sitting up as if struck by skyfire. The other, living animal on the fur gave a soft squawk of disapproval and shook itself. "� Moonwing." Newt held out a hand, slow and hesitant as if the owl might vanish before his very eyes. His fingers met feathers and earned an affectionate buff. He must have made a noise � a laugh or perhaps a gasp � because the next thing he knew Cloudfern and Greenweave were awake and looking at them. They were smiling. "Well look at that," Greenweave said, chin rested on one of Cloudfern's shoulders, "looks like your fingers aren't safe just yet, lifemate." That got a chuckle out of Cloudfern. Newt would have said something, but Moonwing cuddled closer, distracting him from his fathers. For each moment his hands touched feathers the reality of the situation settled in deeper, warming his heart. "He's getting a bit big for his den-tunnel," Cloudfern commented, eyes heavy-lidded with sleep. "I'll have to fix that in the evening. And figure out a better way to keep the cold out when he's using it. He's torn a hole in the hide covering. Again." Cloudfern's words stirred something inside Newt. It wasn't a sudden realization or epiphany. It was more that sensation you got when you'd been sitting still in one place and just realized the sun had been gone long enough for cold to seep into your bones. Despite the lack of shock it took Newt a heartbeat or two to decide what to do. Should he say something? Should he wait for the evening when they'd all had their sleep? Should he wait for�? He shook his head, which earned him confused looks from both his fathers and Moonwing. Well, as confused as an owl could look. "I think�" Newt said, searching for the words, hoping they wouldn't hurt Greenweave and Cloudfern with their suddenness. But waiting would only bring indecision. "I think it's time I had my own den." The glove combined with wrist guard fit snug around Newt's hand and lower arm. It had only taken one follow-up with Moss to get the size right and now it was Moonwing's weight alone that spoke of his presence on Newt's arm, not the prick of talons. But Newt wasn't thinking much about that. In this moment Moonwing was light as a feather. Newt himself was light as a feather, filled with a strangely calm excitement. The wood of the long sealed den bent to Cloudfern's magic, opening a door-hole to reveal the space inside. Inside it was dark and the air stale, and yet Newt felt welcome. With a last pulse of green glow the opening of the den was finished. Cloudfern turned to look at Newt and said: "I'll shape something for Moonwing once you're more settled. And once we've figured out a way to allow him to come and go without freezing your ears off." Newt gave a nod, eyes drifting away from Cloudfern and toward the door-hole. "Feel free to look around inside," Cloudfern said, stepping back from the newly shaped door-hole. "I'll go help Greenweave start carrying things you'll be needing." If Newt had turned around he might have caught sight of the bittersweet smile on Cloudfern's face. But he didn't. In that moment the soft thrill of the new-yet-old feeling in the place before him absorbed him. He let Moonwing take flight and made his way inside his first very own den.